← Captain Marvel is #1! 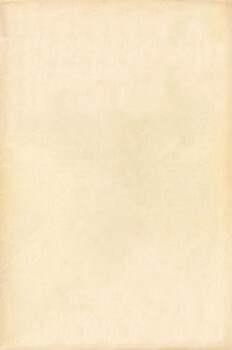 Not long ago, I received an email from my friend and men­tor, Lar­ry Hous­ton. He’d stum­bled across the exis­tence of this toy motor scoot­er from the ‘60s that had a fig­ure of Thor rid­ing it. Marx Toys had appar­ent­ly licensed the rights from Mar­vel Comics to man­u­fac­ture and sell these. Oh, and I shouldn’t for­get to men­tion that they made the motor scoot­er pink. Why Thor would even need to be tool­ing around on a motor scoot­er in the first place is one ques­tion. But why some­one at the toy com­pa­ny made the con­scious deci­sion that Thor’s scoot­er ought to be pink is one of those big ques­tions in life that I just don’t think we’ll ever have an answer to. I had been aware of the exis­tence of this toy pre­vi­ous­ly, but had kind of for­got­ten about it until Larry’s email remind­ed me. In response, I was able to show him evi­dence that not only had they done this with Thor, they’d sold toys of Cap­tain Amer­i­ca and Spi­der-Man on motor scoot­ers too. Spider-Man’s was also pink, but for some rea­son they allowed Cap to have a yel­low scoot­er. You can see all three toys here, if you’re curi­ous. 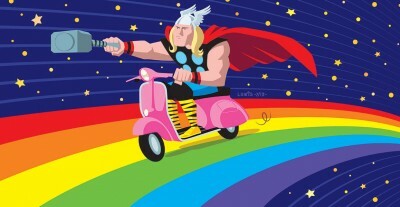 Any­way, the men­tal image of Marvel’s god of thun­der on a pink motor scoot­er stuck with me. Some­times these things just have to come out, so there you go! Per­haps this could even start an inter­net meme, of peo­ple draw­ing Mar­vel super­heroes on pink motor scoot­ers! I mean, why not? This entry was posted in Comics, Personal and tagged Adobe Illustrator, Experiment, Marvel Comics, Silver Age, Thor. Bookmark the permalink. 4 Responses to The Mighty…Motor Scooter?? I don’t recall hav­ing known about this, but I do have Cap­tain Mar­vel in his Shaz­a­m­mo­bile. Which was actu­al­ly part of a sto­ry in the last days of the SHAZAM! title. I have only a vague rec­ol­lec­tion about that one. A bit more famous (or maybe I should say “infa­mous”) com­ic car would prob­a­bly be the Spi­der-Mobile Mar­vel gave Spi­der-Man for a time in the ‘70s. A dune-bug­gy in NY City, no less! Appar­ent­ly this was a case where the toy com­pa­ny Mar­vel had licensed the rights to want­ed the prod­uct to appear in the com­ic. And it did, off and on, for a peri­od of about two and a half years. The actu­al toy looks a lit­tle dif­fer­ent from how it did in the com­ic. You can see it here. Can I pick mine up? Where do I get it? You’re want­i­ng to buy your­self a pink motor scoot­er? …Oh, you mean one of these toys! I haven’t looked, but per­haps they crop up on eBay or some­place like that?